Telemark stems from the earliest form of skiing and is characterised by the Telemark turn. The style is graceful, flexible and, at times, a considerable physical challenge! Exercise TELEMARK TITAN 2018 (Ex TT19), the British, Royal Navy (RN), Army and Royal Air Force (RAF) Telemark Ski Championships run by the Army Telemark Ski Association (ATSA) will take place in Pralongnan La Vanoise in France, over the period 12-24 January 2019. 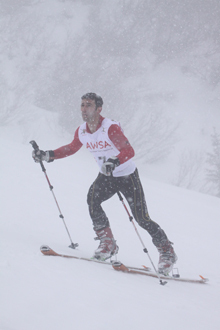 The Army Telemark Ski Association (ATSA) was set up in 2007 to promote Telemark skiing at all levels within the British Army.However, we welcome and encourage all participants. Our Championships are held in January every year and are open to all services and UK civilians making them the Open British Telemark Championships. Encourage new telemarkers to start racing. Run an annual Telemark championships. Through this, promote RN, RAF & Inter-Services Telemark racing, and provide a focus for British Telemark racing; this event is therefore open to RN, RAF, UK Civilian and other military competitors, with individual and team prizes awarded accordingly. Send a British Army team to the Inter Services Championships. 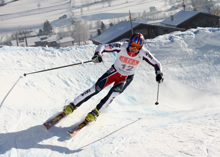 Support GB Telemark – the focus for the British national team. The International Ski Federation – click here to visit the Telemark pages of their website. For possibly thousands of years, Norwegians crossed the land in winter using two wooden skis: one long one and one short one, which helped to push the skier along with a ‘skating’ action. By the 1200s, equal length skis were in use, although these were long, straight and difficult to turn. Sondre Norheim was a Norwegian farmer and carpenter, who shortened and ‘waisted’ his skis, and developed flexible larch bindings, that allowed him to turn and stop easily. He demonstrated his telemark turn at a ski-jumping competition in 1868 and this led to a huge rise in the popularity of skiing. The telemark turn was further developed into the Stem Christie turn, which was easier and better-suited to steeper ground, and this gave rise to Alpine skiing. For more, see the excellent Wikipedia article on Telemarking. Telemarking enjoyed a strong revival in the 1980s in the US. Although it started as a traditionalist movement, Telemark skiing has since benefited from the application of modern technology and a steady widening of interest around the world. You still can ski in the backwoods with wooden skis and leather boots, if you like, but the top end of the sport also employs the latest ski technology, enabling a very demanding sport. Looking for a Change? Some Alpine skiers come to telemarking having ‘become bored’ of downhill skiing. Telemarking offers a huge range of possibilities: it’s great on downhill slopes, ideally suited to off-piste and fantastic in deep powder. Challenge. Somewhere mid-run, your thigh muscles will absolutely insist that Telemarking is more physical than Alpine skiing! It takes time to master, but it’s worth persevering. Freedom. Unless you’re wearing top racing kit, Telemark bindings and boots are a lot more comfortable and easier to move in than Alpine kit. Slip on some skins, head for the quiet spots and make some tracks down new snow fields! Tradition. Some like the traditional aspect to telemarking and enjoy turning heads as they ski past with Norwegian jersey and larch pole. If this is your thing, you can still buy new all-wooden skis and leather boots, for a truly ‘back to nature’ experience.